I road a scooter across this bridge at about 30kph in the rain. Now, I can’t say I really did this out of stupidity — I just had no choice. I was cruising along a dirt track on the wrong side of the Mekong in Cambodia when the trail turned left and dropped onto this. Another driver had just passed me going the other way, so I had no hint that just beyond the bushes ahead of me the trail dropped onto the Bridge of Death. There was no time to panic-brake, no time to plan or choose the best line. There was only a moment to take a breath and curse as the bike plunged 6-8 feet down the worn, wobbly ‘bridge’. At the bottom, instinct kicked in and I cranked the throttle to power up the far side. I stopped, caught my breath and took 4-5 photos. This is the only shot that was in focus — the others were blurred from my hands shaking. Damn. Wes, that is probably the sketchiest crossing I can imagine taking, and in the rain no less! You must have nerves of steel, I’m used to two wheels and I probably would have ended up in the river. Great photo, cool story. Ride safe man! Awesome photo, Wes. I don’t think I’ve ever come across anything like that in my life. I’d love to see you do this again but with a GoPro attached. Holy mama I think I would have had a heart attack. Now that’s what I call intense! lol I’m glad to see that you made it to the other side…especially in the rain! I would certainly be proud of making it across that death trap. The funny thing is that a local would have two or three small children clinging to their bike as well, life on two wheels is incredible! Glad to hear you made it through unscathed and more experienced for your next bump in the road. Oh my god.. That’s crazy! I’m so glad to hear you made it across. Looks like something out of Indiana Jones! I wouldn’t have WALKED across that thing, much less ridden a motor scooter! HOLY CRAP! I too wouldn’t even walk across that if I was stupid wasted! Congrats for making it and living to tell about it! Damn, if you keep pulling that kind of shite, I guess we better meet up for that beer sooner rather than later. I was like! oh yeah! that’s extreme yet cool! that’s what I want every time I go for a trip!adventure and challenge in one! 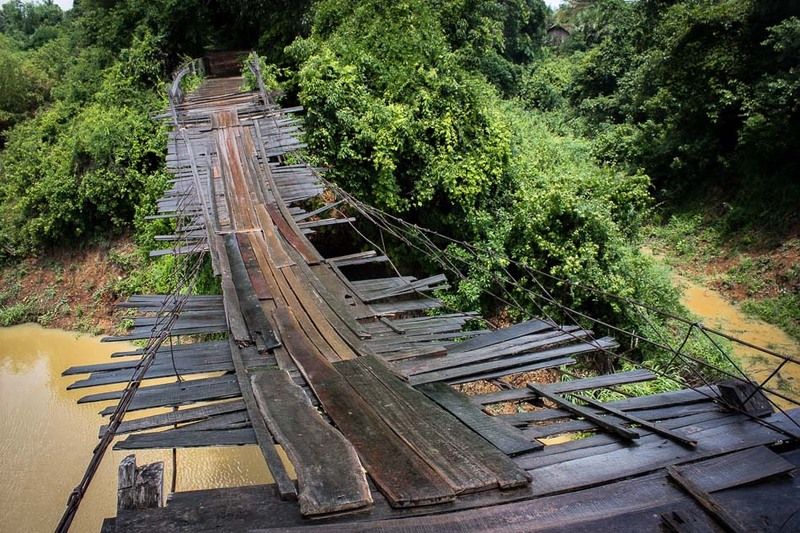 Now that’s a bridge that’s seen better days! Glad you made to the other side okay. I wouldn’t even attempt that on foot. Great photo! What a heart-pounding experience you had! Its like you are daredevil. I’m very sure that its one thing you can’t forget about. That sounds, and looks, hella scary! Wow. Adrenaline much? I would have been terrified. Haha, nice! I don’t know if I would have tried this. just for the fun of it? No, I just had no choice. Couldn’t see it coming. Wow! That will get your heart thumping. Mine is just from looking at that photograph! But, you obviously survived, and now you have an amazing story and a wonderful memory of the experience. I think its kinda dangerous to cross on that kind bridge. Concerned sectors must do something about that to make people safe from crossing.